Zebronics has launched its new sound bar called the Zeb Juke Bar 2. It is priced at Rs. 4,949 and is capable of wirelessly connecting to devices via Bluetooth. The sound bar comes with 7.62cms mid/high range driver and 12.7cms low range driver. Besides Bluetooth, the device also offer other connectivity options such as USB and SD/MMC. With the success of Juke bar came its successor, Zebronics, a brand known for its diversified technological innovations to create enriching experiences, announces the addition to its sound bar range with ‘Zeb Juke Bar 2’ which is not just Wireless but effortless too with great sound only for Rs. 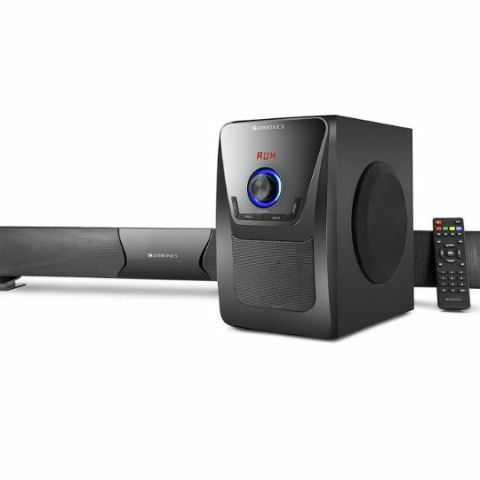 4949/ - undoubtedly one of the best priced sound bars with Bluetooth in this range. With the room full of sound, and the World of Wireless Music Zeb Juke Bar 2, is born out of a desire for elegance with glossy front panel and the ultra slim profile to add new dimension to your home cinema set up not only in sound but also in looks. Although slim the incredible sound is really something to behold. The sophisticated matt black finish and high gloss LED display adds a sophisticated touch to your home cinema set up. Zeb Juke Bar 2 produces rich and immersive sound that matches your mood, whatever you are watching. The sound-bar comes with 7.62cms mid/high range driver and 12.7cms low range driver to deliver 40Watts RMS audio output. The subwoofer can enhance bass sounds whenever you feel the need for rich deep tones. Its wide spatial sound feature brings the powerful cinema sound effect with the built in bass enhancer for rich deep tones, bringing powerful cinematic sound effect. Being friendly to the devices, is the wireless Bluetooth connectivity, USB and SD/MMC connectivity, which makes it compatible to variety of input mediums for your family. With inbuilt FM and support to mp3/WMA directly from USB devices, its hard to fall in love with Juke Bar2. Tailoring the user experience is the fully functional remote control for added convenience. With 1 year of warranty, the product is available with leading retail stores across India.